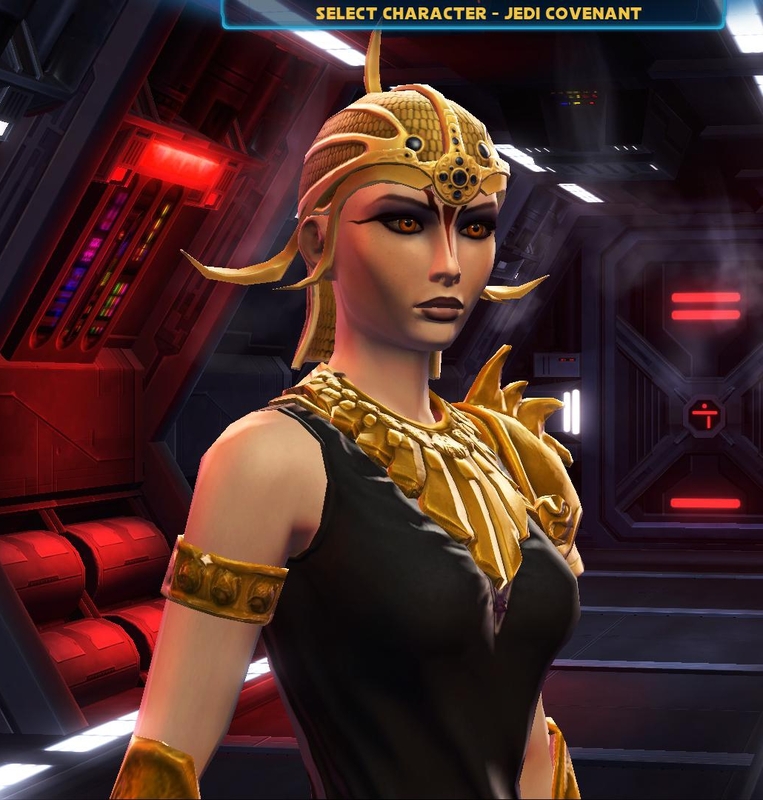 My sith marauder is rocking this stunning ensemble which, previously, was hatless. And then I found a matching hat. And I’m totally wearing it. I may have lost my mind. 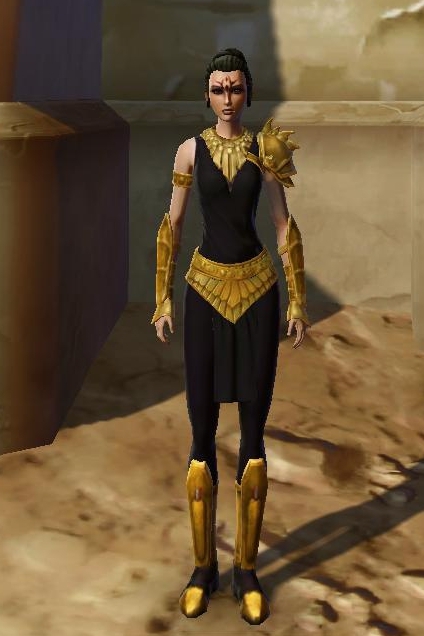 The black and gold looks really nice! Your toon looks great. I can only think of a woman in her late fifties going to yoga class. The outfit would be better if it either had both pauldrons or lost the one remaining one; Bioware seems to have a fixation with Fashionable Asymmetry (look it up on tvtropes.org), right behind their fetish for Shoulders of Doom (likewise). The cap, though, does give you a place to hang the severed [insert body part here] of your enemies if you want to go the intimidation-by-craziness route (like Blackbeard plaiting slow match into his beard and lighting it before boarding an enemy ship). I really HATE the single pauldron. It was a huge debate in my mind whether to give up on the outfit completely because of it. However, I was in the market for something sleeveless so this one spoke to me (and the gav daragon was out because, for whatever stupid reason, I hate capes). I’ve tried to avoid the idiot asymmetry/shoulders fetish the gear designers have; I’ve got a Bounty Hunter with the Energized Infantry chestplate (the flange at the left shoulder), and one Inquisitor with a dyed Traditional Thermoweave chestpiece. I _still_ wish that they’d gone with two dye slots — one primary, one secondary — and made all the dye packs single-color, so you could make your own color combination from the limited range they made available. It wouldn’t have been as big a cartel-coin sink for people chasing the black/black or white/white dyes, though, but I think it would have made players happier with what they could achieve; there are some pieces that look _horrible_ with any but one or two of the primary/secondary pairs, and don’t fit well with any of the single-color dyes. Unfortunately, I got _hugely_ spoiled by the costume creator in City of Heroes — you paid the tailor fee, and you could have _any_ costume parts in _any_ of the color combinations you wanted, without affecting your powers at all, and could have up to five or six costumes you could switch to any time you wanted. And if you just wanted to change the colors, not the pieces, it was almost pocket change. Having grown up a Navy brat, and worked as a civil servant for the Navy for thirty years, it still irks me to see Troopers and their companions running around looking like battlefield scavengers; you’re supposed to be an elite Republic _military_ unit, and they’re called ‘uniforms’ for a reason. With my Troopers, I’ve chosen to go with a ‘standard’ outfit of the Tempered Laminoid chest and legs (gives coordination with M1-4X’s color scheme), Lacqerous Mesh helmet (or Commando’s Helmet for the character — they can wear it, but the companions can’t because they’re not ‘troopers’), and the Reinforced Phobium boots, with the Interstellar Regulator ‘Besh’ weapons (except for the assault cannons) for weapon uniformity. It makes the character and their companions look more like a _unit_ in cutscenes. With Jedi, I suppose that your clothing is one of the few real expressions of individuality you’ve got; with Sith, it’s a reflection of your ego and self-importance; BHs and Smugglers are going to be pretty individualized. With Agents, though, it still bothers me sometimes that most Agent gear has you running around ‘undercover’ in what amounts to an Imperial uniform; it would be nice to have some of the Smuggler-appearance shells. Well… it may be a bit silly, but it does match. Sometimes a combination just works. Reminds me of this lady on TOR Fashion and how she somehow manages to make the bat ears look good. Yes, she does make the bat ears look good, I remember seeing that one when it was first posted.